Twitter is a social network, where people share their thoughts, observations and any other information they want to share in a real time, using short 140 symbol messages. Twitter has over 271 million monthly active users and 500 million Tweets sent every day. Almost 80% of Twitter users Tweet with their mobile devices, which make them staying here-and-now all the time. Twitter is a great tool for your business to get in touch with consumers and to build your marketing strategies for e-business. And now let us discuss some suggestions on how you can use Twitter for building your e commerce business strategy. If you do not have a Twitter profile yet – create it. The next thing you will need to do is to optimize your Twitter profile for business. Below is a great video on How to do that. Pay attention to putting all the required information in proper sections of your profile – it will help your consumers to get knowing you better. There are two ways on how to build the ecommerce strategy of your Twitter account – the free one and the paid one. The use of hashtags: The simplest way to search for a specific interest or product is to use a hashtag. Research on what your consumers are interested in and use this information to reach more people. Active position: Tweet often not to be lost in a great number of Tweets, repost the Tweets you consider to be the most important several times per day, Retweet the most relevant information connected to your area of business, try to be helpful – Tweet answers to the most common issues that may arise in your area of business expertise, answer to the Tweets of your consumers, maintain a dialog. Research on @s: How to get to know if people are discussing you? Check the @ mentioning. Use the @ mention to get to someone you would like to reach. Do not do it very often though, no one likes spam. Special deals: offer special deals or contests to your followers. You may use such a Tweet, for instance – ‘The first 20 people retweeted this post will receive a 20 percent off coupon’ or ask people to post their pictures with your product and to make a special prize for the best picture. Combined social media approach: Make your profiles in different social media connected. For instance, when someone is asking you a question in Twitter, respond with a short answer and give a link to the full response at another site. Also do not forget to put a Twitter button to your website. You may also like to use Twitter timeline on your website – to have a stream of latest news on your account. All these methods are quite effective for an e-business strategy but are also pretty much time taking. They will require constant day-to-day work with your account. But time is money. How to fasten the process? The good solution here would be the Promoted account. Twitter offers you two paid options to rapidly increase the number of followers. Those are promoted Account campaign and promoted Tweets campaign. The first one is to get more followers to your account, the second – to reach to more users with a concrete Tweet. You can set up a budget for your campaign, choose a target audience and location to reach users you would like to be your consumers. 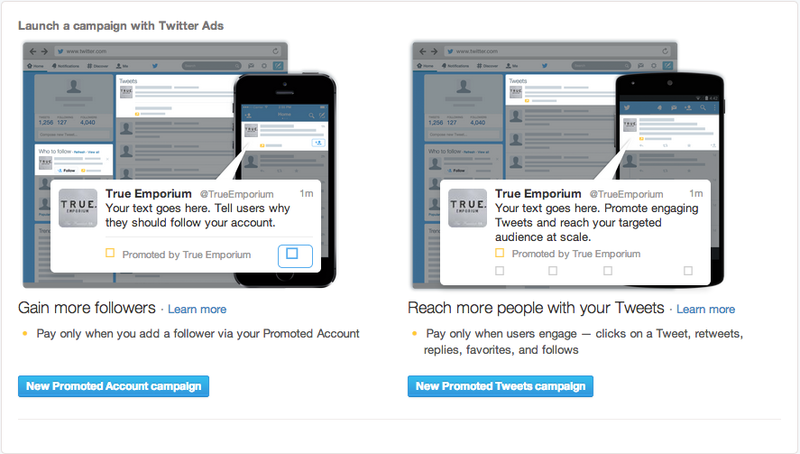 Here you can find a detailed instruction on How to Set Up a Twitter Promoted Account Campaign. Any other tips and tricks for your business strategy? Yes! Two brand new features from Twitter. During the recent year Twitter was testing the new “Buy” button, allowing to make a purchase with a simple click from Twitter. It was available for a limited number of users, and now they are expanding the service to more than 100,000 merchants and are going to expand it wider. The nearest time each small business will have an opportunity to sell directly from Twitter. Make your account set up before the new feature will be available. The second great feature for your ecommerce strategy is Twitter Product and Place pages. According to a message on official Twitter blog Product and Place Pages will allow users to get extended information on certain products and places, i.e. Tweets, pictures, videos, price, website etc. and to buy the product directly from the product account. The users will also receive an opportunity to create Collections of products they like. It will be perfomed with a special “Browse” button. Undoubtedly, with a development of social media technologies you will be required to keep abreast of the developments of your e business strategies. However, in a certain way with a wise approach these new technologies are to bring you more consumers and customers. Build your business strategy with an understanding of Y-generation values and it will not take your business long to grow. Please, share with us your thoughts on what are the future ways of social media development in the comments section below.